Dr. Segler: Today we’re at A Runners Mind speaking with a true running shoe expert about the top-five running injuries: plantar fasciitis, metatarsal stress fracture, Achilles tendinitis, shin splints and IT band syndrome. We’re going to discuss the ways that runners can troubleshoot these injuries and keep running. We’re here today with Dawson Alexander at A Runner’s Mind which is one of my three favorite running shoes stores in the San Francisco Bay Area. And in case you’re wondering my three favorite (and most recommended) running shoe stores are A Runner’s Mind in San Francisco, A Runner’s Mind in Burlingame and A Runner’s Mind in Lafayette. There are a bunch of great running shoe stores around San Francisco, but those are the three that I recommend the most. I am here today with Dawson. He is a bona fide running shoe expert. He is the shoe buyer he knows more about shoes then the overwhelming majority of people I talk to including virtually every podiatrist that I know, including myself. 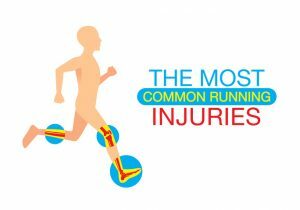 We are here today to talk about the most common running injuries that we see and help runners can troubleshoot those injuries and hopefully take care of them, keep training, keep running and stay on track with their goals. Dawson thanks for having me here today to talk about these injuries. Dawson: Sure, thank you for being here! Dr. Segler: What do you think are the most common injuries? I think probably the most common one by far is plantar fasciitis. I don’t know if that’s consistent with what you see? Dawson: Yep, we see a lot of that! Dr. Segler: Yeah, so that’s bothersome, right? Plantar fasciitis is very, very common. In fact in the US, heel pain, which mostly is plantar fasciitis, accounts for about 40% of all visits to podiatrists in United States. It is so common that I actually wrote a book on Runner’s Heel Pain. The big thing that I see is that it’s not going to kill them. It’s just that it’s disruptive. It basically it doesn’t hurt so much that they stop running. But it hurts enough that the runner may limit the running so much that they’re not enjoying it fully and it may keep them just below their optimal training, so it’s bothersome. But it’s not killing them. So what do you see with plantar fasciitis is that consistent with what you see? Dawson: Yeah, that’s absolutely consistent with what we see with athletes coming to the shop. Whether they re the runners, walkers, or fitness enthusiasts, they will complain of arch pain or heel pain. Plantar fasciitis symptoms resonate with everyone a little bit differently sometimes. Sometimes it’s a dull achy pain, sometimes it’s a really sharp pain. And then we hear a lot that it’s the first thing they feel in the morning stepping out of bed, waking up, and coming off the bed. The reason that happens is that there is fluid accumulation around the bottom of the heel. 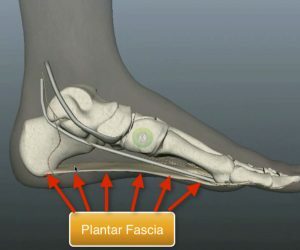 There’s also a nerve on the bottom of the heel that runs right around the plantar fascia where it attaches to the heel bone. And the plantar fascia is trying to heal itself. So when you get up and step on it after you have been resting, you squish the fluid that’s accumulated around the bottom of the heel. That fluid then compresses the nerve. You also suddenly stretch out the plantar fascia abruptly and it causes that sudden jolt of pain. You start walking and then it kind of loosens up. So that’s the big thing. If that’s your story, then the chances are good that you have plantar fasciitis. Now, what people worry about, or at least the runners that call me say that they are worried that they might instead have a calcaneal stress fracture, or another condition that is a little more concerning in the sense that they think it’s going to break if they run on it. So they get worried. So then that’s where the dysfunction in the training comes in. They still run. But they’re not really sure if it’s plantar fasciitis and they don’t really know if they have a stress fracture or not. And they think that if they have a stress fracture it might blow apart, explode the heel bone and ruin them. They’re a little bit terrified. So they don’t maybe push as hard as they could. And that’s what I see. So with first steps what do you guys here at A Runner’s Mind recommend when a runner comes in who thinks that they have plantar fasciitis? Dawson: Often times we want to understand their training volume, particularly if there are any sudden spikes in activity or intensity. The other aspect we like to view is there footwear, too. Are they wearing the tight right type of shoe? How old is that shoe? Because if you are training regularly, you want to stay on top of replacing that footwear periodically or as often as necessary based on volume and intensity. Dr. Segler: Right! I do the same thing. When I see athletes at home that is one of the first thing I look at. If you take any shoe for example, and you run in it, it feels great when you first start running. And it continues to feel great as you’re running in it. It feels the same from run to run. But after you’ve run a few hundred miles and all of that running has compressed the EVA material in the midsole, it gets a little bit more wobbly. You are pronating and it stresses the plantar fascia more. When I see runners I actually look at the side of the shoe. If there are wrinkles there then I explained that the only reason there can be wrinkles on the side of the outsole is that the EVA is actually collapsed and crushed under there. When that happens the shoe is less stable. If you take that exact same shoe and then you come into the store and try on a brand-new one, can you run down the sidewalk they will feel like completely different shoes? They even feel like completely different models. They don’t even feel the same, right? I think that’s really crucial. So one of the first things that you can do if you think you have plantar fasciitis is to check the shoes and make sure that you don’t have excessive wear. I think that’s really crucial. Keep in mind that the range of mileage you’re running shoes can survive is huge. For example, I think I probably weigh twice as much as Dawson. So although Dawson may be able to run twice as many miles as I can before the shoes are worn out. Because the EVA in the midsole material my shoes is getting crushed under my bulk. You also have to make sure that you’re not over pronating. You have to make sure that your gate isn’t off. And if you are a heel striker or you have a bouncy type of run with more vertical displacement you may wear out the running shoes faster. It’s pretty simple. The way that I think about it sounds like plantar fasciitis, first of all it probably is plantar fasciitis, just statistically speaking. So if you think you have plantar fasciitis you can do a couple of different things. You can go see a doctor. Or you can try to just do the really simple things that would help you get better. If it responds to that treatment, then it’s not a stress fracture because a stress fracture is not going to get better with the treatments for plantar fasciitis. What I typically tell my patients as that of all the literally hundreds of things that you can do to help heal plantar fasciitis, that are reported to help with plantar fasciitis, there are really three self treatment that help the most. Icing to reduce the inflammation. Stretching a little bit in bed. Doing the ABC’s or a similar type of exercise to loosen up the plantar fascia and the Achilles tendon before you get up and start walking. Achilles tendon stretches to stretch out the plantar fascia and decreased a load to the plantar fascia. These are the biggest things. Most runners with plantar fasciitis who do those three things will usually start to get improvement within a few weeks. And if it’s improving then you don’t have a stress fracture because again, a stress fracture is just not going to get better with those treatments. The other conditions that can mimic plantar fasciitis like a nerve entrapment or bursitis, they also don’t really improve when you do the treatments that do help plantar fasciitis. That’s what I generally tell them. What do you guys recommend? Dawson: So we always want to troubleshoot certain areas like footwear. That’s the key thing to look at, if we need to replace that at all. Understanding whether or not the individual is on their feet all day long. If you have a job that requires you to be on your feet, day in and day out, on hard surfaces we look at different solutions. Whether it’s wearing a compression sleeve to help increase blood circulation and blood flow and muscular support, or maybe you need to add an insole temporarily to alleviate the plantar loading or the weight loading throughout the course of the day. Or maybe you need a massage ball to break up some of that scar tissue. Again, just improve blood circulation in that general vicinity. Dr. Segler: That really can help. That’s one of the big things! If you’re going to get some new running shoes. Or if you I think that you may need to get new running shoes because you see those little wrinkles on the side of the shoe that indicate that the midsole EVA cushioning has been crushed and worn out a little bit, make sure that you bring your running shoes into the running shoe store. Because it is really helpful if the experts in the running shoe store can actually look at your running shoes. Personally, when I see injured runners at home, I like to see their running shoes, analyze the wear pattern and look and see how worn-out the shoes are. I would imagine when you guys are fitting them for new shoes that is also helpful. Because you can see if they are wearing out the shoe asymmetrically which might indicate that they are in the wrong type of shoe anyway. And I would imagine in that case you might suggest a different model, because just a new shoe of the same type may not be sufficient. That is one big tip: make sure you bring your shoes in so that they can look at your running shoes. If they are going to do a run analysis to look at your run form and they have that additional piece of information before looking at your form when you are running the experts here at A Runner’s Mind can look at your shoes and see…are there any real clear indications in your running shoes that you might actually have some sort of biomechanical dysfunction that needs to be addressed either with either a change in your running form or even a little bit different type of running shoe. Dr. Segler: OK, the second condition that affects runners that we are going to talk about is Achilles tendinitis. This is a condition that I see frequently. The Achilles tendon is the largest tendon in your entire body. And of course we all know the tale of Achilles, but it’s not as quite it’s not quite as severe as that. You’re not going to get shot in the heel with an arrow and die. 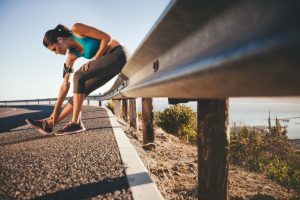 However you may feel like you are going to die if you have been training hard for months for a marathon and your Achilles tendon starts bothering you. Dawson what do you see when runners come in and they’re worried that they have an Achilles tendon is she what do they usually talk about first? Dawson: We see it a lot quite frankly, myself included. Because I love high-intensity. I love running fast and I love running volume. Marathons are my favorite distance. And doing all of those things at the same time can be really stressful on the body. Often times what we hear his athletes describing aches or sharp pain along the Achilles tendon. Inflammation or sometimes it’s dull and achy. Sometimes the pain along Achilles tendon is really intense. It’s really tender to the touch. No matter if they are in a supportive shoe or a neutral shoe, It doesn’t really matter. They can still experience pain. It makes weight-loading especially through the propulsive state of running it can be really hard. Some athletes will want to run through it which is a really dangerous game. Achilles tendon problems for a long period of time. Most people don’t usually call me when they have the very, very early stages of Achilles tendonitis. Paratendinitis. This is where you have an accumulation of fluid between the Achilles tendon and the paratenon or the little sheath or covering around the Achilles tendon itself. It sort of fills up with inflammatory fluid. That is the earliest stage of Achilles tendon problems. That’s the easiest to fix two because it’s just fluid around the tendon. The next thing that happens is true Achilles tendinitis. This is inflammation and fluid within the Achilles tendon itself. It’s a little more severe and a little harder to fix because it’s a little further along the same continuum. If you ignore all of that and you continue to train long enough you will get tendinosis. Achilles tendinosis is where you have had chronic trauma, chronic inflammation, actual degeneration of the collagen and damage to the collagen bundles within the tendon itself. The Achilles tendon gets thicker. The Achilles tendon get gets this lumpiness to it. You can see it when you look at someone that has had chronic Achilles tendinitis. 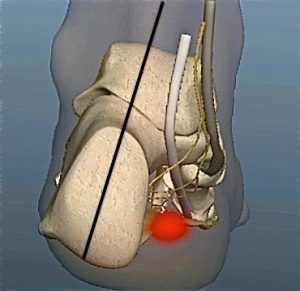 If a runner has tendinosis and you compare their good tendon to their injured Achilles tendon there’s an enormous difference in the thickness in this little area doctors refer to as the “watershed region” of the Achilles tendon, which is just up above where the Achilles tendon attaches to the heel bone. You really want to avoid Achilles tendinosis. We can fix it, but most runners don’t like the way we fix it. Basically it’s either a PRP injection, stem cell therapy or surgery. And that is extremely disruptive. The Achilles tendon has to be taken seriously. You have to try to do something initially to fix it. The very earliest signs I hear of an Achilles tendon problem is like this. Runners will say that they It feels kind of weird. It feels like there’s a sock or rubber band or something wrapping around the Achilles tendon just above the heel bone in this area called the watershed region (which is an area that doesn’t have really good blood flow). That’s where the Achilles usually gets injured. It doesn’t heal very quickly because the blood flow is not great in that area of the tendon. repeats when you’re on these really long runs on trails in Woodside or in Marin, if you’re doing lots of running on hills, you have to pay attention to that odd sensation in the Achilles tendon. Because if you shut that inflammation down initially you’ll head off all the trouble. 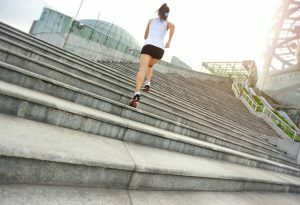 But if you tell yourself, “No, I have the schedule that I have to follow, I have to stick to my hill repeats, I have to stick to my speed work, and if you ignore the Achilles.” That may be at your peril. So when people come into A Runner’s Mind and they mentioned that they might have an Achilles tendon problem, what do you tell them? What do you suggest? Dawson: The first thing is to understand training volume. We also like to look at their running shoes and make sure that they’re not wearing or worn out running shoes. If they have tight calves, it’s about finding solutions about how to strengthen the calf and also regain flexibility. If we need to modify it their running will. We like to offer solutions such as rolling out the calf muscles. There are lots of great massage tools to help relax the calf muscle, and help get into the Achilles tendon to break up scar tissue and increase the blood circulation. One of my favorite tools for Achilles tendinitis, which is one of my chronic issues, is an Achilles brace that I love wearing. It has these silicone gel packets which you can freeze. The little silicone gel packets squeeze either side of the Achilles tendon. Post long runs, and after run at high intensity, I like to ice the Achilles tendon immediately. It is important to keep the inflammation at bay. That is the key here is to keep things at bay. You want to make sure that it doesn’t become full blown Achilles tendinitis, or even worse Achilles tendinosis. Dr. Segler: Right! And that brace really is great! Because it combines two different therapies in one. It is both compression and cryotherapy. It has those little gel pockets that goes around the Achilles tendon that squeezes the tendon to keep fluid from accumulating around the Achilles after you work out. I can be really helpful, I think. So it’s not something to ignore. You want to get it checked out or at least try to do something initially. If it’s in the early stages, frankly, lots of home treatments will work. There are lots of things you can do on your own. But you don’t want to ignore Achilles tendinitis. That is the main message here. You have to do something! If you just stick your head in the sand you’re going to wind up in trouble. Don’t freak out when you lower your running volume. I just had a patient who, a little over a week ago, she competed it Ironmnan Louisville. She had an injury, but it ended up being her fastest Ironman ever. And she basically didn’t run for the month leading up to the race. Now granted, She was anxious about that, she was worried about not running and how it would affect her race. Anyone with a brain who is a runner would be worried about not running. Yet, it turned out to be her fastest race ever. You can still do well even if you modify your training schedule a bit. Your training schedule is just a plan. It is an outline of how you should do things. Nobody has their plan go 100% intact, even if they don’t get injured. So you have to be prepared to modify your training schedule and trust your plan, trust your own body and trust your coach. I think that is very important. Dawson: Believe in your training! That’s a big part of it. Dr. Segler: That will take you a long way. Just make sure that you don’t of ignore an Achilles tendon problem. If you come into some place like A Runner’s Mind where you can talk to a real expert who can look at your form, look at your running shoes, see what your running volume is like, you may be able to figure out if you are really heading for trouble or not. You can really do a lot for yourself to keep running without having to worry so much about completely blowing it right before your big race. Dawson: We’re all about rehab, not rehab here. That is a big thing for us. We believe that if you can catch it in the earlier stages you’ll be a lot better off and it makes life a lot easier. Dr. Segler: Exactly. You have to be proactive! That’s the bottom line. It makes total sense. You train for Forever for a marathon. It’s not like you just decided You’re going to do one. But you have to Understand it over training injuries can happen to anybody. And they can happen without a whole variety of stresses that maybe you didn’t plan for. You just have to be prepared to make any adjustments that you need so that you can stay on track. Just remember the end goal. If you do that, you can continue to train, and potentially do well, even if you have Achilles tendinitis. But you have to talk to an expert and make sure that you get the right advice. Dr. Segler: The next thing we’re going to talk about is metatarsal stress fractures. Everybody worries about stress fractures. Dawson: Oh man, stress fractures! Dr. Segler: So this is a classic thing. They worry if they do too much, too fast too soon they might get a stress fracture. Well, they do happen. They have an all kinds of people. I have Had a stress fracture. My wife has had a stress fracture. I see tons of patients with stress fractures. Now, the big thing that I will say is that it’s really simple. But I think you have to understand that stress fractures represent a range of trouble. Everybody thinks that when they get a stress fracture what it is a small crack in the bone that they see when you take an x-ray. The fact is the overwhelming majority the time that you get an x-ray when you suspect do you have a stress fracture you see nothing. It looks completely normal. The radiologist even reads the x-ray as completely normal. That’s because of how a stress fracture works. And I think it’s important to understand the way that stress fractures develop. The way I explains it to patients is like this. Let’s take a coat hanger. If you start bending a coat hanger and you bend it a bunch of times, it actually starts to heat up. That’s the first thing. It actually gets hot from the friction in the metal. But it doesn’t actually change, until you have bent it enough times. That is really analogous to a stress response in the bone. The bone can bend a little bit. But if you really aggravated with lots of back to back long runs or lots of back to back speed workouts, you’re likely to get inflammation within the bone. It heats up basically. That’s a stress reaction. If you get an MRI right then the radiologist will review it and see inflammation within the bone which will be read as a stress fracture. In that case some doctor is going to tell you that you have to have a fracture walking boot for six weeks. And that is complete malarkey. It’s just not true. If you keep bending the coat hanger more, then you’ll start to see physical deformation in the surface of the coat hanger. You get opacity and change in the color of the metal first. If you keep applying for us, and keep bending the coat hanger, then it starts to get surface cracks. That is more analogous to a real stress fracture. If you keep on running on that, it will crack, just like the coat hanger. And if you continue to ignore it and you think to yourself “I am tough I can do this,” it will completely break. If you’re dumb enough to keep running on it when your foot is black and blue and you’ve already cracked the bone, The broken bone will move out of place. That is when you get a displaced stress fracture. If you get a displaced a stress fracture a foot surgeon like me has to cut your foot open, put the bone back in position and attach a little metal plate and some tiny little screws on it and stabilize it. You do not want that, obviously! Now in the very early stages, you don’t have to do much to fix it. You just have to remove some pressure. You just have to remove some stress that’s been applied to the bone. It’s a stress fracture. So think about it. If you decrease some stress so it can heal you can continue to train. There are lots of methods for doing this. You can apply pads in other places to try to shift some of the stress away from the metatarsal that has the stress fracture. You can cut out some of the material under the metatarsal bone so that it decreases the force applied to the bone and decreases the stress. You can also ice the foot where do contrast baths or some other method of reducing the inflammation which will also reduce the stress. There are lots of ways to get the bone to calm down quickly. There are lots of ways to decrease the stress being applied to the metatarsal enough so you can still train and still do your race, sometimes even if it’s only a few weeks away. But you have to do the right things. So what do you guys do when you see a runner who comes into the store who is concerned that they might have a stress fracture? Dawson: First we talk to them about volume, just to get an idea of why the stress reaction might have occurred. Sometimes it’s because too many speed episodes, or too much intensity or too many hill repeats. Maybe it’s just been too much volume at once. Sometimes it’s back to back racing. All of these can combine into a snowball effect. Then you can get something like a metatarsal stress reaction or a full-fledged metatarsal stress fracture. That’s never fun to deal with because it is kind of hard to troubleshoot at that point. Because if you continue doing something applies more stress you can get into a worse situation. Some people will come to us and they have tried adding more cushion under the foot. And yes, sometimes that can get you through your race, but again, we want to consider a series of active therapies which might include decreasing the weight loading, impact, stress and forces. We may suggest that you might need to swim or ride a bike for a little bit. Some people like to try to add compression to reduce the inflammation and enhance blood circulation. Sometimes that can help a little bit. But a bone stress reaction is a bone issue it’s not just a circulation issue so there’s not too much we can do there other than alleviating a lot of the stress and loading that the metatarsal bone is taking on. So it’s tricky. But actually that’s good and bad. It’s bad in the sense that if you add additional material under all of the metatarsal bones you actually add additional force to the metatarsal bone that has too much stress and has developed a stress fracture. That’s a problem because you’re adding increased stress to the injured bone. If instead you add the padding underneath all of the other metatarsal bones, and not the metatarsal bone that has the stress fracture that will actually help. But you have to be cautious not to add additional material underneath the metatarsal bone that hurts. I see people often doing that as a mistake when they are trying to apply padding. The other thing that has to be considered is just what you mentioned previously, and that is the active recovery part. I personally completely disagree with the general premise the physicians dump on runners that say you should stop all activity so that you can heal. Runners don’t do well when they stop all activity. That is my experience. That is what I believe to be true. Dawson: That is what studies have shown as well. Dr. Segler: Right! Active recovery, like Dawson said is Better. 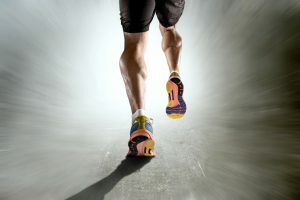 Whether that means shifting to cycling shifting to swimming, just modifying some of your runs a bit or a combination of things where you take some pressure off of the metatarsal bone and then maybe hold off of the hill repeats or decrease your speed work, you do need to reduce some of the stress. The goal in my mind is not to make you improve as fast as possible, but to help you improve fast enough that you get to race day intact, while maintaining as much fitness as possible. That should be the goal. And if you go on complete bed rest are completely stop running, that’s not going to help you achieve your goals in my experience. Dawson: If you just stop all activity you lose out on a great deal of fitness at that time. Dr. Segler: You do! But when someone comes into the store with a metatarsal stress fracture what would you consider? Would you consider changing their entire shoe? Would you want to switch them to a different type of running shoe? Dawson: Not necessarily. It kind of depends upon what ultimately led to this situation in the first place. Again, we can try to decrease the pressure by adding an insert to the running shoe and removing some of the pressure under that spot that is applying all the force to the metatarsal that is getting a stress fracture. Some people experiment with these larger geometry shoes with a bit more of a metatarsal rocker to decrease some of that pressure but that’s not always necessary. It is a tricky situation. Dr. Segler: I assume t he Hoka is what you’re talking about correct? The Hoka does have a big rocker under the forefoot that can decrease some of the metatarsal loading at the forefoot which can help, but at the same time, if have been training for months and you’re ready to run the race, I am not a proponent of switching your shoes right before the race. Dawson: No! That is a dangerous game. Dr. Segler: But at the same time, if you come in to the running shoe store and they look at your shoes and you’ve done an entire ramp-up, an entire build phase, everything in preparation for your marathon over the course of months in the exact same pair of running shoes, and they are worn out, you may have actually gotten a stress fracture because your pronating too much. You are wobbling on this crushed EVA, in which case you don’t really need a different type of shoe but you may just need a new pair of running shoes. And I do see that happen, too. Some people have too much flexibility in their foot. And if they are running in a running shoe that is too flexible for their foot type, that additional pronation can shift the weight and the pressure from the fourth and fifth metatarsal to the second or third metatarsals. When all of that pressure and force shift from the outside of the foot to the central metatarsals during the course of pronation it can lead to the stresses that build up, I came in late and cause a metatarsal stress fracture. It is something that needs to be looked at. The idea isn’t that you necessarily need to change your shoes if you have a metatarsal stress fracture, but you do need someone who is an expert (like Dawson or any of the people at A Runner’s Mind) to take a look at your running shoes, your foot type, you’re running form and see if they can determine If the shoes are worn out, if your pronating through the shoe, or if you’re running shoe isn’t really perfect for your running form and your biomechanics. What are the horror signs that you see with metatarsal stress fractures in runners? Dawson: Sometimes it is general inflammation. But many times it’s tenderness. You can really isolate that spot. You put a finger on it push right into it and you can feel the tenderness in the metatarsal bone. If it alters the way that you’re walking or running, that is a dangerous game to be playing as well. Dr. Segler: For me that’s true as well. Pin-point tenderness is a key with metatarsal stress fractures but again, just like the coat-hanger analogy it’s a range of trouble. Pain is the first thing. Swelling is the second thing. So if you look at your feet and you compare them and you can tell that one is swollen compared to The other, if the tendons on one foot are a little less visible than they are on your non-injured foot, That’s indicative of a more serious problem. If you get bruising, that is the worst sign! That means something broke. Something tore. Something cracked, like the bone and caused bleeding under the skin that you see as a bruise. So if I look at a runner and I am concerned that they may have a metatarsal stress fracture and they have bruising, that is not a good sign and we have to take it seriously. Dr. Segler: The next thing we are going to talk about is shin splints. Shin splints are common. I had my own bout of shin splints that went on literally for decades. When I was a kid I was running a ton. Pretty much any weekend that I could get up and get my dad to take me to a race on the weekends that was within driving distance I would go run a 5K or 10k. I started doing those when I was really young and I loved it. And I got shin splints. Anytime I would run into really hilly area, which was pretty much any place that I ran where I live, I would get shin splints. And I tried everything to get them better. Now, this may actually date me and give everybody an indication of how old I am but there was a television show on at that time called, “That’s incredible!” On the television show there was an episode where they had Sorbothane inserts, which were supposed to be this new space-aged material. The Sorbothane was supposed to absorb shock. On the television program they showed somebody running in slow motion and they showed how the inserts or decrease in the amount of shock and vibration into the runners legs when they landed on the Sorbothane inserts. My dad actually drove me to Atlanta so we could buy some sort of thing inserts because that was the only place to where we could actually find them. But it didn’t really help. Then I got the Nike Air Pegasus which was the new, cool air-conditioned midsole running shoe. It didn’t help. I went for literally years with shin splints every time I would train and hard or do hill repeats Anytime I would do hilly runs, I would get shin splints. And the shin splints never really went away. That not even progressed into adulthood. Anytime I would do hill repeats or long runs on a hilly course I would get shin splints. That didn’t change for me until I actually changed my running form. When I change my running form that fixed it. And I have not ever had another case of shin splints in years. I have done lots of marathons and lots of Ironman triathlons, all without shin splints. Anterior shin splints are basically just overuse of the tibialis anterior muscle and irritation of its attachment to the tibia or shinbone at the front of the leg. It’s where the muscle is pulling really hard on your foot to pull it up high enough to run uphill. So if you’re doing lots of hill repeats or lots of runs on really hilly courses, you may get anterior shin splints. The good news is that anterior shin splints will basically go away immediately if you just stop running on hills. This is more common and more troublesome then anterior shin splints. In this case you actually get tenderness when you push on the medial aspect of the lag or right on the inside edge of the middle one third of the shinbone, halfway between your ankle and your knee. I can actually be caused by lots of different things. Medial tibial stress syndrome is really poor ly understood. When I was in residency there was an orthopedic surgeon I was working with named Dr. Johnston. He was an excellent orthopedic surgeon and he was a marathon runner. And at the time I was on that rotation I was giving a presentation at the University surgical department on running injuries. And when it came to defining shin splints I thought Dr. Johnson will know what this is and how to best explain it. Dr. Johnston looked at me and he said, “Chris, shin splints or something you sent to somebody else because you can’t operate on them.” No this is a guy who is an orthopedic surgeon and a runner and he didn’t seem to really know how to truly explain in simple terms what causes medial tibial stress syndrome or shin splints. There’s a broad range of how people define shin splints. There’s also a lot of variability in what people seem to believe causes shin splints. Some people say that it is the posterior tibial tendon that pulls on the covering of the bone called the periosteum. 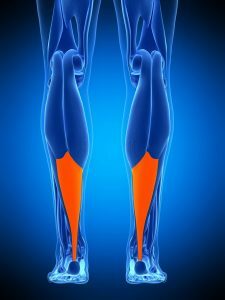 The argument is that with overpronation the posterior tibial tendon and muscle pulls on the covering of the bone irritates it and then causes inflammation and pain that you feel when you get shin splints. Some people say it’s just a stress reaction from too much pounding on the shin bone that causes swelling under the covering of the bone. But it’s treatable. In my case, I tried all of this stuff for decades. Yet in the end all I really did was change my running form so that I was more of a mid-foot striker, less of a heel striker and BOOM…my shin splints were gone and they’ve never come back. I also tried icing. And, I should know what I’m doing, but just to make sure that you understand no one is immune from stupidity, I will share the story with you. I was actually traini ng for a marathon when I was in residency. I was determined to have a new PR. The shin splints got really bad the week before the race. I took one of those blue refreezable ice packs and I put it right on the front of my leg right where the shin splints were the most tender. I wrapped it in an ACE wrap. I was determined to get the inflammation down before the race. So I decided to leave it on for 15 minutes. When I took the ice pack off my leg the skin was white and hard as a rock. And the next morning I had frostbite blisters on the front of my shin. And yes, they were there when I ran the marathon. That is not the best way to get a new PR. Icing can’t help but you can overdo it as evidenced by my stupidity. So again there are lots of things that can help. I think can help. Compression sleeves can help. You can run with compression socks which will decrease some vibration control the inflammation and help add stability that may reduce your incidence of shin splints. They’re all these things you can do. You can stretch. You can stretch and strength in the posterior tibial tendon. But in my experience it is really running form and making sure you have the right running shoes. If you’re running in the wrong shoes and you’re too unstable, they’re too soft for you that can cause shin splints, I think. I’m curious what you guys see here in the store and what you think about shin splints? What are the connecting conditions, is it the shoes? Is it their run form? Dawson: It’s a combination of things. 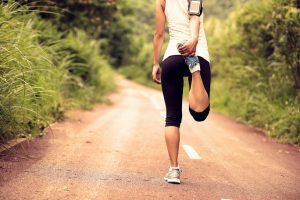 Shin splints are poorly understood and there are a lot of contributing factors which is what can make it tricky or a little finicky to deal with. Often times we will look at your running shoes and will do a whole gate analysis to assess your biomechanics, how you are moving and how your weight is coming across the foot to give you a better idea of what’s the root of cause. But it’s the surfaces that you’re running on, too. Are you running on a really hilly runs vs. flatter runs? Are you running on a banked surface? Are you running on concrete or asphalt? If you’re running on a bank surface then you may only be feeling it on one side and you’re compensating on the other side. These things can all wreak havoc and it can be so tricky to look at. Heavy heel strike and can cause shin splints, too. You start to feel that impact reverberate straight up the front of the leg. A lot of training volume, a lot of intensity can cause it to flare-up. We actually have a team member on staff right now who is dealing with an episode of medial tibial stress syndrome, who has that medial tibial stress syndrome pain and pressure there that were trying to work through. In general we will try to assess a few different areas to get an idea and understanding of where we need to start troubleshooting. Do we need to replace the shoe because it’s too worn out and you’re not getting the cushion and sufficient support that you need anymore? Or is it the intensity? Or is it that you are a heavy heel striker and we need to adjust some of your basic running form that way? Dr. Segler: So with shin splints it’s really not a huge problem. It’s not going to kill you. If you just come in, see an expert, get an assessment then you can make sure that you’re running in the right type of running shoes that you don’t have a shoe that is worn out and that you’re running foot form isn’t off in a way that is contributing to the shin splints, that will really help you continue to run and continue to train. One other note about shin splints. There is a condition called exertional compartment syndrome. This condition is written about a lot. I think because it’s one of those frightening things. Exertional compartment syndrome often mimics the symptoms of shin splints or medial tibial stress syndrome. Basically what it is is that the muscles build up pressure and it builds up pain to the point that it can actually damage the muscle and cause necrosis or death of the muscle itself. The way that we check you for exertional compartment syndrome is that if you came into the office the doctor would look at you, listen to your story and perform a physical exam. If we suspect you have this condition then we would literally have you run up-and-down the stairs until it starts to hurt. Then after you have exercise for a bit, at least enough to reproduce your symptoms, we stick a needle right in the compartment and measure the pressure in the compartment. With a needle attach the pressure gauge we can actually tell with the pressure is. If the pressure is too high then it assumes that you have compartment syndrome and a fasciotomy is the recommended treatment. Fasciotomy is the surgical release of the layer of tissue that stabilizes the muscles. We basically just take it to the operating room cut it open and don’t so the fascia back together. That’s what the treatment is. You probably don’t have to be a surgeon to recognize that that is not the ideal treatment for a runner. I have seen lots of runners. I have looked for runners that have true exertional compartment syndrome. I have seen lots of runners that have shin splints who are convinced they have exertional compartment syndrome. In most cases these runners just have medial tibial stress syndrome or a tibial stress fracture. To date I have never done a surgical fasciotomy on a runner with compartment syndrome. I have done surgical fasciotomies on patients but most of those were trauma cases where somebody has been run over by a truck or they’ve been in some sort of high-energy drama and developed compartment syndrome as a result of the tissue damage from the trauma. But this is not exertional compartment syndrome that is often written about and seems to become confused with shin splints. I think exertional compartment syndrome is exceedingly rare. 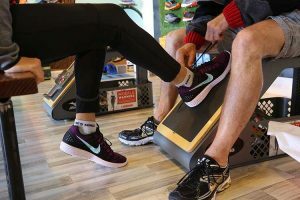 If you come in and get assessed by an expert who knows running form, who knows running shoes and can try to combine those evaluations and help you understand what has been causing your shin splints you should be in good shape. Dr. Segler: The last thing we’re going to talk about is iliotibial band syndrome or IT band syndrome. The IT band that you hear about a lot, which is written about a lot on blogs and websites to talk about running injuries, the IT band or iliotibial band is a band of tissue that goes down the outside of the leg starts at the ilium, which is one of the parts of your hip and go always down to the tibia or shin bone just below your knee. Most people to get IT band syndrome know that their tight. Almost every time that I get a massage before an Ironman race with a sports massage therapist, they always comment on how tight my IT bands are. Now I have only had one very small episode one time when training for an Ironman race and I think my saddle was in the wrong position, which is what ultimately had caused it to flare up. I kind of noticed it and I started to become aware of it because of what I do seeing patients. I made the appropriate adjustments to my saddle height. I iced it and I got to calm down right away. It completely went away. I didn’t really do that much to treat it. But it can be a problem because this is extremely painful. Unlike some of the other conditions that just sort of nag you, IT band syndrome can get painful enough that it really stops in your tracks. Because your knee is going to be killing you. What I hear from patience is that they have pain on the outside of the knee. It is often related to activity. What do you hear from runners you come into the store and suspected they have an IT band syndrome? Dawson: It’s usually outside knee pain. It’s really uncomfortable when they are walking up the staircase or down the staircase. They don’t seem to notice the knee pain as much while they’re running, but afterwards they notice the outside of the knee has some tenderness. Dr. Segler: Right, so the IT band really flares up when they run. But it’s really that substantial flexion that causes it to get worse. If you go to the gym and you’re doing squats or something that is just a killer. So if you’re doing weight training to supplement your run training you may notice the IT band pain when you’re doing lunges or deep knee bends, where you’re doing these exercises that have a lot of flexion in the knee. That’s what really seems to aggravate the IT band further. What do you think helps? What do you and the experts here at A Runner’s Mind do when you see somebody who has IT band syndrome? Dawson: We always look at their running shoes just to make sure that everything is fine there. But a lot of it is understanding what their training looks like right now. Maybe will need to reduce some of the volume before it wreaks havoc. We may also suggest some massage therapy. Self therapy like getting on a foam roller a massage ball. It may also help to try to open up that hip angle. And increase the flexibility. That tends to help. Dr. Segler: There is a lot of stuff that has been written about IT band syndrome. There are even studies that have been that have actually been published that show that IT band syndrome can be treated in just a couple of days if you completely immobilized the knee in a full-leg immobilizing brace and ice the knee virtually around the clock. But who is going to do that? It’s not realistic. Unless you can take a few days off of work, how are you going to hobble around on crutches? The point is that IT band syndrome is something that is easily treatable. Because it’s inflammation of the bursa and the band of tissue over the outside of the knee. That’s what’s causing the knee pain. You can slow down that inflammation. But you don’t have to panic. It’s not like you have an Achilles tenants about to rupture. You just have a progressive inflammatory condition that is getting worse with activity. Avoiding the things that cause pain or certainly helpful. One caveat to that is that most people have tight IT band, when they start foam rolling they will often say that it’s really painful to foam roll. For example, I personally use a rumble roller to roll my IT bands. That is a really aggressive foam roller. And on top of that, I have the black one which is very rigid, almost like a four-wheel drive tire. It is super effective but it does hurt when you roll your IT bands if they are tight. I am just lucky in that (for whatever reason) I have never gotten a case of IT band syndrome that was disruptive to my training. But I’m sure that my day is coming. Again, my IT bands are super tight. And that’s what really predisposes any runner to IT band syndrome. It’s the tightness. Then you add in a little bit of a gait abnormality, and then a little bit of the wrong activities that place too much stress on the IT band where it passes over the knee. If you’re running stairs or doing something else that aggravates it then you get IT band syndrome. Dawson: That’s true. And many people in this area have desk jobs that can predispose you to developing tight IT bands. If you do a lot of commuting and you’re in that seated position that can also cause tightness in the hips, too. Looking at running form is another area that we will consider. So if we see that the hips drop quite a bit, we know that can add pressure on the IT band. A heavy pronator with that hypermobile foot type that can add a lot of stress and pressure along the kinetic chain, too. So there are a couple of different areas that we can troubleshoot when a runner has IT band syndrome. Dr. Segler: I really don’t know why my IT bands are so tight. But I do house calls. I drive over 40,000 miles a year driving around the San Francisco Bay area seen runners. That probably is not good for me. But that’s what I do. Strengthening exercises can help. Loosening the hips to open up that hit angle can help. But how are you going to know what the problem is if you don’t have somebody SSU. So even if you come to a runners mind, not coming here necessarily because you think you need a new pair of running shoes, but (you may, I’m not trying to say that you need new shoes) I’m just saying that you need to see someone who knows running form who can look at you and assess what’s going on so that you can assess the true cause of your IT band syndrome. Then you can address that. But if you just ice the knee and you put a brace on, it may call on the knee down but if you plan to be active then it’s not going to fix it long term. You have to address the root cause. Dawson: Yeah, a Band-Aid only works for so long. And that’s what we really think of In those situations where you’re adding compression, or KT taping, they are Band-Aid solutions. You have to get down to the root cause before the problem becomes chronic. Dr. Segler: That’s right. You don’t want to just treat the symptoms. You won’t get down to the root cause of the problem so you can continue running and continue training as much as you need to accomplish whatever your goal is, whether that’s a marathon, 10K or whatever. All right Dawson, thank you for having me here today. I think this was all very helpful and hopefully all of your athletes will continue to run and continue to train without any trouble. Just remember you know where to come for help if you need it. Come here to A Runner’s Mind and get a run form analysis and an assessment to see if your gait is off or if you’re running in the wrong type of shoes that you can continue to train as much as you need.